One of the things I like most about Sephardic food is the enveloping aroma of warm spices that just screams comfort food. It’s like a cure for everything from physical to mental. Besides the Jewish-Lebanese-Syrian food we ate at home, we were exposed to a variety of different Sephardic cuisines. 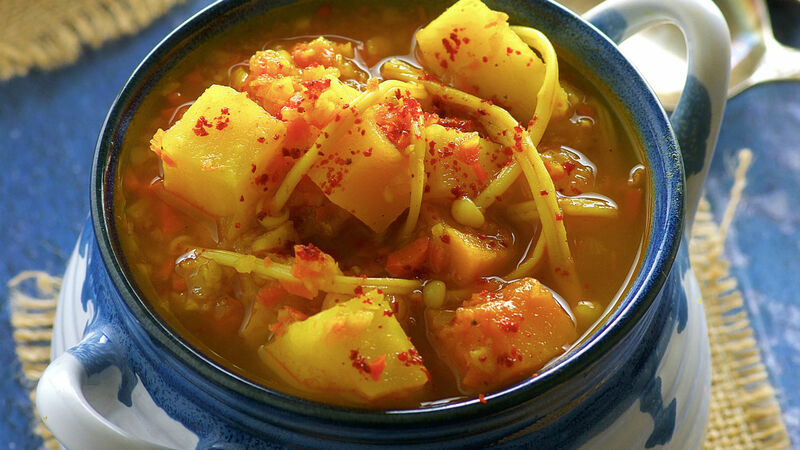 The first time we tasted a Yemenite soup was 7 years ago, and we still remember the warming comforting spiced broth, that we could not get enough of. Yemenite soup is typically made with Hawaij, a spice mix that combines black pepper, cumin, cardamom, cloves, turmeric and coriander. For the Yemenite Vegetarian soup we made today, we used a mixture of turmeric, cumin, coriander and black pepper. We added a whole bunch of veggies and some enoki mushrooms for texture. The result is a warming,comforting and satisfying soup perfect for any occasion. If you have a particular spice you love, or feel like getting creative, you can absolutely play around with the basic Hawaij and make it your own! Combine half the celery root, the carrots, onions and garlic in the food processor and pulse until chopped very small. Heat olive oil in a large soup pot. Add chopped vegetables and cook over medium high heat for 10-12 minutes, stirring frequently. Add tomato paste, salt, turmeric, cumin, coriander and pepper and continue cooking for 3-4 minutes, stirring frequently. Add 8 cups water, bring to a boil and add the rest of the celery root, butternut squash and the potatoes. Reduce heat and simmer, covered, for 35-40 minutes. Remove from heat. Add Enoki mushrooms and let it sit, covered for 5-10 minutes. Enjoy! A satisfying vegetarian-friendly dish chock full of white beans, peas, asparagus and bite-sized pasta. The Jews of Yemen would assemble this buttery, yeast dough and serve it warm and fluffy for a post-services breakfast.